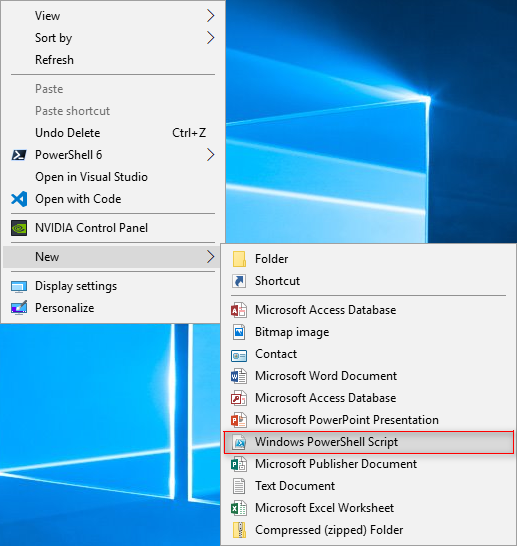 In this article, I’ll show you ho to get a useful context menu item to create a New -> Windows PowerShell script. It will save you time if you need to create them from time to time. You get a new file with the PS1 extension instantly with one click. Create a new sub-key named “ShellNew“. Under the ShellNew subkey, create a new string value named NullFile. Don’t set its value data, leave it empty. This value indicates that Windows should create an empty file without any content. The next time you need to create a PowerShell script file, you can use this context menu item. With the Registry File below, you can do the same a described above. Windows Registry Editor Version 5.00 [HKEY_CLASSES_ROOT\.ps1\ShellNew] "NullFile"=""
Save it to New PS1 File.reg and double click it to import it into the registry. Quick Question, is there a simple way to change the instructions/reg entries so that When I select “New Windows PowerShell Script” from the context menu it will create a file based on a specific file or Powershell template I use for consistency?